Cherry tomatoes make excellent additions to just about any dish that comes out of your kitchen. Nothing tastes better then fresh, sun ripened, cherry tomatoes fresh off the vine. Easily grown in just about any garden, cherry tomatoes require minimal care, and with just the right conditions, two plants can produce enough cherry tomatoes in a growing season’s time to supply you and your family with endless fruit. By following a few simple steps, you can easily propagate cherry tomatoes in your own garden. Purchase cherry tomato seedlings from your local nursery. Check to make sure the seedlings are healthy. Look for seedlings that are not wilted and have dark green leaves and stems. There should be no yellowing of the leaves or insects. Choose an area that receives full to partial sun for most of the day. Till the ground and mix in compost before planting to ensure the soil receives proper nutrients for growth. Use a rake to mix the compost into the soil. Dig holes that are 6 to 8 inches deep to accommodate the seedlings. The depth of the planting holes may vary depending on the size of the seedlings. The soil should come to the first set of leaves on the seedlings for proper growth and support. Water the seedlings thoroughly the first time. Water until the soil around the seedlings is moist 2 inches deep. Water the seedlings frequently, depending upon the occurrence of rain in your area. The soil around the seedlings should always be moist to the touch, but not soaked. Prolonged exposure to large amounts of water can increase the risk of fungal disease. Watering the plants every two days should be sufficient. Place a thick layer of straw around the base of the tomato seedlings. The straw should be approximately 2 to 3 inches in depth. The straw will add in keeping away weeds, and will help maintain proper moisture content. The straw may almost cover the entire tomato seedling, but there are no worries. The straw will help support the seedling while they are young and fragile. Stake or cage the tomato plants for proper support. When fruit begins to grow on the vine, the plants become top heavy. Without proper support the plants are at risk for breakage. Add a water soluble fertilizer when you water the seedlings for the first time. Fertilize the tomato plants every two weeks to keep up the nutrients. 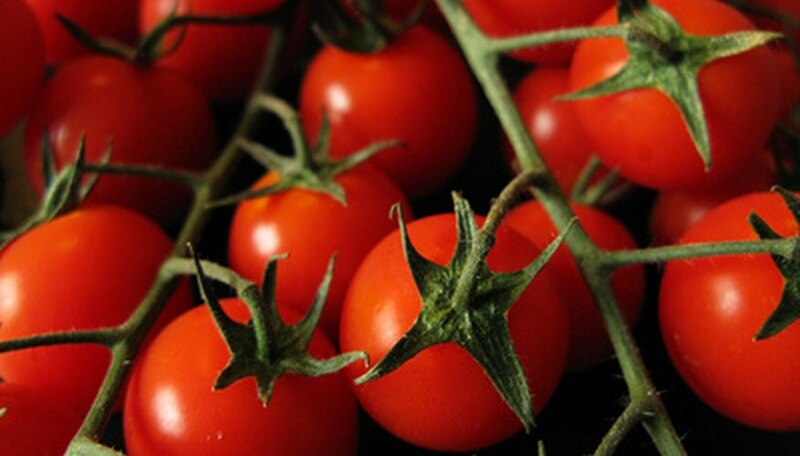 Pick the fruit when the cherry tomatoes are glossy red. Remove the fruit with care to ensure you don’t damage the vine. Hold the vine in one hand and the fruit in the other. Gently twist the fruit while holding the vine. The fruit will easily come off and the plant will be ready to grow new fruit. You may prune a tomato plant, but doing so will dramatically decrease the harvest.